Our month-long look at the jewels of Grand Duchess Maria Teresa of Luxembourg wraps up today with an overview of her use of the grand duchy's most imposing diadem: the Empire Tiara. The enormous, all-diamond tiara has been with the family for generations. (Our lengthier post on its history can be read over here.) 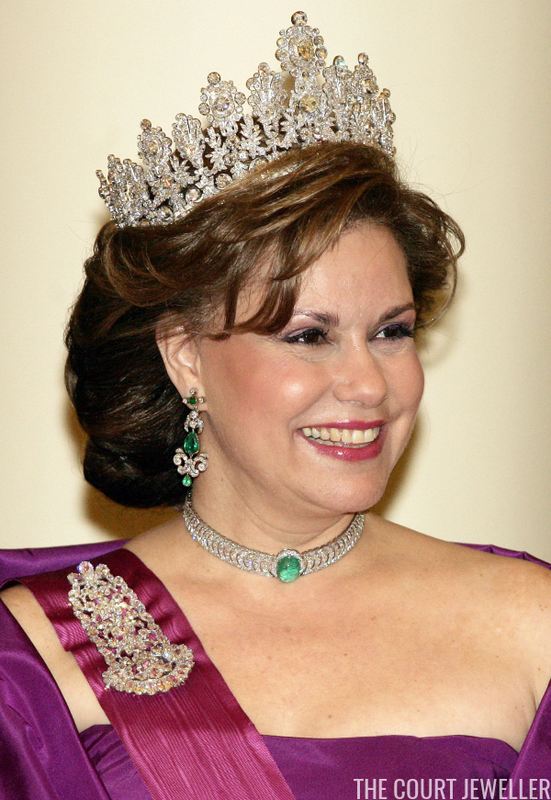 Maria Teresa has been grand duchess since her husband took the throne in 2000, but she did not attempt to wear the Empire Tiara in public until after the death of her mother-in-law and predecessor, Grand Duchess Josephine-Charlotte. 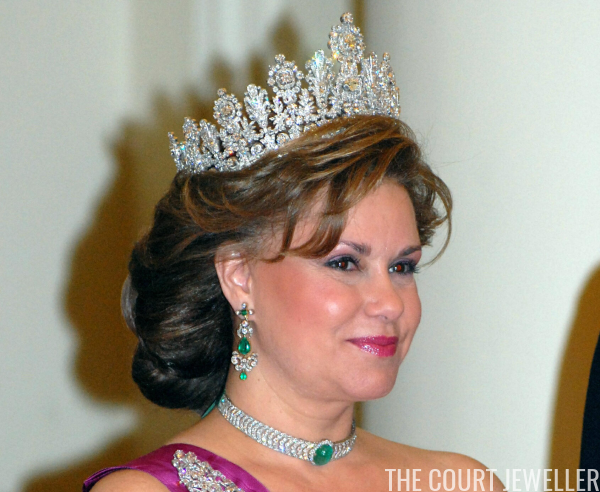 Maria Teresa wore the tiara for a state banquet at the Noordeinde Palace in The Hague. On this occasion, she paired the towering diadem with two diamond rivieres, pearl drop earrings, a pearl and diamond bracelet, and one of the Nassau Rose Brooches. Maria Teresa brought out the tiara again for another important state visit in March 2007, this time to Belgium. The Luxembourgish and Belgian royal families are closely related: Grand Duke Henri's late mother, Grand Duchess Josephine-Charlotte, was born a Belgian princess. The choice of the diadem for this visit was surely a nod to those close family bonds. Maria Teresa wore the tiara for a state banquet at Laeken Castle near Brussels. Appropriately, Maria Teresa also wore a jewel that once belonged to Josephine-Charlotte's mother, Queen Astrid of Belgium: the diamond and emerald choker necklace, which can also be worn as a bracelet or a bandeau. She also wore diamond and emerald earrings and the grand diamond epaulette brooch, which was once a shoulder decoration for an elaborate dress military uniform. For me, this outing of the tiara might be her best, simply because of her more elaborate hairstyle choice. Maria Teresa chose a sleeker hairstyle for one of her most recent outings in the tiara, which came in Stockholm at the wedding of Crown Princess Victoria and Prince Daniel of Sweden in June 2010. This was one of the largest and most glittering royal weddings in a generation, and the tiara was one of many heirloom diadems dusted off for the occasion. For this appearance, Maria stuck with a theme: diamonds and pearls. Along with the tiara, she wore pearl drop earrings, a single (but substantial) diamond riviere, and Princess Ingeborg's Pearl Fleur-de-Lis Brooch. The choice of that brooch for a Swedish royal wedding was surely a deliberate one: after all, Princess Ingeborg, great-grandmother of Grand Duke Henri, was a Danish princess who married into the royal family of Sweden.